The study, published today in the British Journal of General Practice, was conducted by researchers from the Universities of Bristol, Oxford, Edinburgh and Exeter. 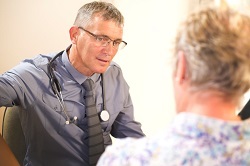 Introducing alternatives to face-to-face consultations in primary care has been proposed as a solution to the increased demands on general practice. Despite claims about how this may improve access and efficiency, the extent to which technologies such as telephone, email and internet video consultations are used at present is unclear. There is also little evidence to support claims they reduce GP workload or improve patient satisfaction. This study – the first of its kind in the UK – aimed to identify the frequency and range of ways general practice teams in five areas of the UK were providing alternatives to face-to-face consultations, or had plans to do so in the future. The researchers sent a postal survey to more than 400 practices in and around Bristol, Oxford, Lothian, the Highlands and Western Isles of Scotland. The areas were chosen to include practices with a range of characteristics: urban and rural, inner city and remote, and in affluent and deprived locations. The survey was part of a larger study called The Alt-Con Project, funded by the National Institute for Health Research Health Services and Delivery Research Programme.